Universal Moduler Icemaker. The Cord is not included with this icemaker. The cord can be removed from your old icemaker and reused on this one. Head Cover, Bail Arm & Water Trough included. This icemaker is designed to fit specific Whirlpool manufactured refrigerators including Roper, Kitchenaid, Amana, Maytag, Jenn Air, Magic Chef and some Sears Kenmore. This will not fit GE, Hotpoint & Frigidaire manufactured refrigerators. 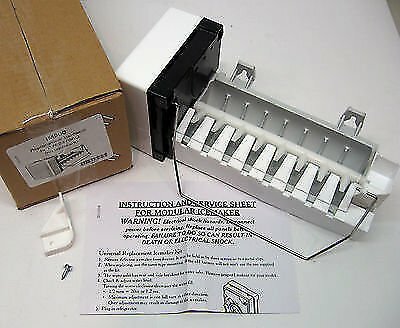 This icemaker is a replacement for 95109-1, 626626, 626636, 628366, 626639, 626640, 4211173, 4317943, D703817, D7824701, D7824702, D7824705. D7824706Q and R0156806, 61005508 Just remember you must use your old cord. The cord plugs into the head of the module, held in by a spring clip. Installation Instructions Included. Send us your refrigerator model number and we will verify if this is the correct fit for it. The Cord is not included with this icemaker. The cord can be removed from your old icemaker and reused on this one. Head Cover, Bail Arm & Water Trough included. If you have any questions about this product by O&HP, contact us by completing and submitting the form below. If you are looking for a specif part number, please include it with your message.